If you’re looking for teeth replacement, a cosmetic treatment to improve the appearance of your teeth or zygomatic dental implants to recover your smile, we have the perfect place for you. People traveling to another country to receive dental work is more common every day. Is very popular among Americans and Europeans to travel to Mexico because of their inexpensive prices that are between 50% to 80% lower compared to the U.S.
Getting extensive dental work usually involves spending lots of money. With Dental Tourism is possible to get the best medical care while saving thousands of dollars. Los Algodones, Mexico is a little town located just seven miles from Yuma, Arizona. Thanks to its convenient location, their great treat by the best dentist in Mexico, and for their affordable prices, the city is known as the capital of Dental Tourism. There are two options to get to Molar City: flying or driving. If you leave near the Yuma border, it will be convenient budget-wise to drive directly to the city. However, if you’re coming to a dental clinic in Los Algodones from far, taking a plane can be the best option for you. Many patients fly to the nearby airports in the United States, like Phoenix and San Diego then, they take a connection flight to Yuma, Arizona. Sani Dental Group offers shuttle services from the airport to our clinic, for free! If you're traveling to Mexico for medical tourism from Canada or the United States you won't need to apply for a formal visa, but it's important that you keep in mind that the maximum period of time you can stay in the country as a tourist is six months. So you only need to make sure your passport is valid for at least six months from your arrival in Mexico, the officers at the migration booth won´t ask for it before entering Mexico, but you will need it to go back to the United States or Canada. When starting to plan traveling outside of your country of residence in order to get dental treatments it’s very important to trust the place where you’re going and the dentists who are going to perform a procedure. We know that it can be hard and overwhelming to choose someone to trust your smile, we want to make it easier for you to find the clinic and doctors that suits your needs. This little town is also known as the Molar city and it has more than 300 dental clinics, so how do you know what dental clinic in Los Algodones you should pick? Sani Dental Group attends thousands of patients every year, offering them great service for a price they can pay. As the largest group in this town, we count with two clinics with the same procedures and prices. Both of our clinics are located on the principal streets of the city, they count with high-quality equipment and the best tools for our doctors to perform the treatment you need. You’ll feel comfortable in every step of the procedure. It is very important to be able to communicate during your trip. Choose a clinic where the staff and dentists can speak your language so you can understand every step of the procedure they will perform and for you to express all your questions and doubts you may have. Sani Dental Group’s dentist are all bilingual, so you’ll have no problem during your appointment. At our clinic, you can find flyers, brochures with information about the different treatment, prices, warranty policy and more, written in English. In case you need any further information feel free to ask one of our dental staff members they gladly will answer any of your questions and help you understand all details about our procedures. At Sani Dental Group language barriers do not exist! One of the most important things to do while looking for a clinic in Los Algodones is to do a little research about the doctors’ experience and credentials. Dentists in Los Algodones are skilled and ready to ease your pain. At our clinic, all of our dentists are certified in multiple dental practices updating their skills and prepare to give you the service you deserve. All of the doctors working at Sani Dental Group have graduated and worked under a continuous education program. Every year they participate in seminars and courses all around the world. Many dentists at the Molar City have different specialties such as periodontics, oral surgeon, implantations, and more. Sani Dental Group dentists count with long experience working as doctors to be confident that they’re highly trained to perform almost any kind of dental treatment from a simple procedure like a dental cleaning to a more laborious procedure such as Zygomatic implants. In order for you to have the best dental experience visiting another country, we listed some tips you should consider before traveling. 1. Plan ahead for complications. Do a little research on dental clinics before you make a decision, learn more about the procedures they’re offering. 2. Ask for the facility credentials and the staff experience. 3. Collect your health records to avoid any medical complications. 4. Ask about the materials and tools used in the different procedures. 5. Review clinic recommendations and ask to see before and after photos. Crowns and Veneers: Both of these procedures are very popular for people traveling to Mexico for a dental appointment. These procedures represent solutions to fix a damaged smile by providing a natural look and comfort. Dental Implants in Los Algodones “Molar City”: The cost of dental implants is one of the reasons Mexico has become such a popular destination for Dental Tourism. Sometimes we think that quality may be compromised because of the affordable prices, but this is not the case. We know the most important thing is having a high-quality dental work. Dental Implants are usually more expensive than other procedures, compare for yourself how affordable dental implants are if you visit the correct place. With these lists of our different treatments, we hope that you have a clear idea about Mexico dentist prices. Click here to look at all of our prices. You may be thinking why are dental treatments in Mexico so cheap? Is it safe? Dental clinics in Mexico keep the same standards as the top countries, their prices are just a benefit of getting dental work in Los Algodones, Mexico. • No insurance requirements for dental care. • The cost of living in Mexico is low-cost. • The government subsidizes many dentists education, without asking for big loans. Therefore they don’t have the need to overcharge for their services. Zygomatic Dental Implants in Mexico: Zygomatic implants are a new alternative that avoids grafting and sinus lift procedures, as they’re anchored in the upper jawbone which is close to the Zygoma bone (cheekbone). • Regular implants take around six months to heal, with this procedure you can get your implants sooner. • Restored smile in appearance and functionality. Recovery time after this treatment is about four months. After this time, a final restoration can be applied. Then, patients can enjoy their new set of teeth. Sani Dental Group has access to and OR at Baja Surgery Center, in which this procedure can be done properly and safely. We’re the only clinic in the area with the right equipment and save environment to perform this surgery to patients who need a new smile. Technology has advanced to an extraordinary rhythm this pasts years. Clinics all over the world have the necessity to keep investing in the latest technologies and equipment in order to be able to provide the best dental work. The best dental clinic in Los Algodones count with the top technology and is credited by the American Dental Association. At Sani Dental Group we want to treat all dental procedures with the best and modern technology available. Top technology allows doctors to provide their patients with precise diagnosis and anticipate any further complications. Credentials give the clinic standards to work with. Clinical Credentials certified as a quality medical service facility. 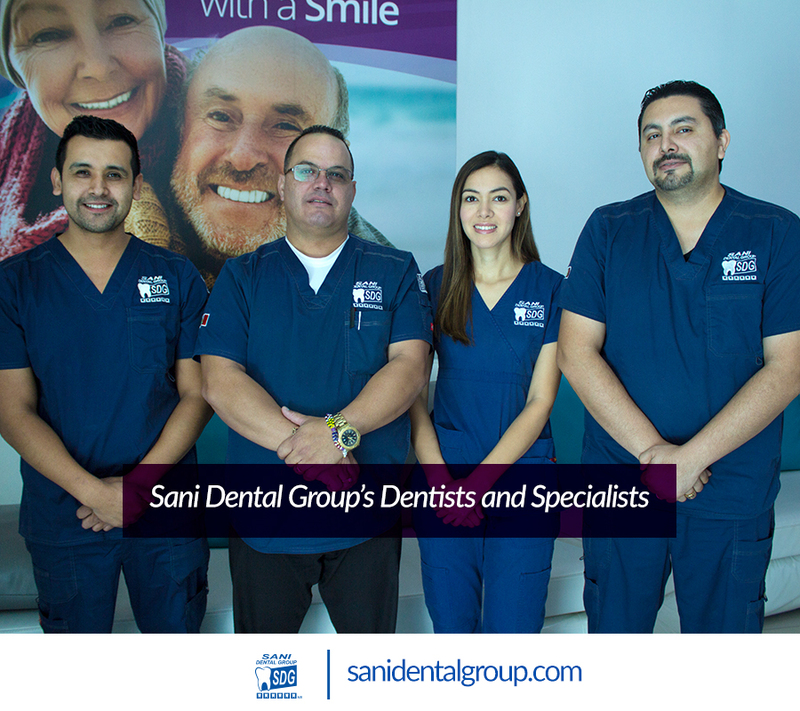 Sani Dental Group is a proud member of different organizations, it is a form that validates the quality work we offer, ranking us as the #1 Clinic in Los Algodones, Mexico. The Business Bureau (BBB), Medical Tourism Association (MTA), and the Mexican Council of Medical Tourism (MCMT) are some of these organizations. To look at all of the different associations which give Sani Dental Group the opportunity to build trusts among our patients click here. Trustful Clinics offers warranty in all of their treatments. We trust our doctors, that’s why at Sani Dental Group we offer up to 5 years of warranty in any dental treatment. Our clinic offers patients several options to pay such as cash, debit or credit card, personal travelers' checks, and wire transfer. Plus, we work with two trustworthy Finance Companies. You will be provided with an application form, send to the finance company that will provide your interest in a dental credit or loan. We’re compromised in giving you the best medical experience. When you go on dental vacation, you don’t need to waste your time and be guessing where to go to complete your treatment right? This is why you should look for a place that has all services and procedures done on the same clinic. Depending on the needs of each patient, some extra studies will be requested by your dentist. Our clinic offers all diagnosis equipment and procedures on the dental clinic in Los Algodones without going to another place. We count with our own on-site laboratory, the best and newest x-ray in the city. At Baja Medical Imaging prevent and improve health issues with the help of specialized technicians, located next to our clinic at Alamo Street. It has been proven that the increased concentration of Platelet Rich Plasma, can potentially speed up the healing process of treatments like dental implants surgery, tooth extractions, bone graft, and more. Enjoy the PRP Treatments available at Sani Dental Group. But coming to Mexico is not only about going to the dentist and have a procedure. Los Algodones is a great place to have the perfect mini vacation while improving your smile and lifestyle. Located in the heart of town, MediPlaza is the place where you can find the best medical treatments in the city such as stem cells, dental, surgery, hyperbaric, and optical services. Conveniently located just 2 blocks away from the border, is the best option for the Medical tourists, offering them the complete Medical Hospitality experience. Sani Dental Group is aware that some treatments need a different space to be performed due to their difficulty level. Thanks to our collaboration with the only ambulatory surgery center in town Baja Surgery Center, our dental patients have access to an OR and necessary tools for a surgery dental procedure if needed. Baja Surgery Center focused on providing same-day surgical care, including preventive and cosmetic procedures. All of the procedures are performed by qualified doctors using advanced techniques following every safety standard. 2. Thanks to a Stem Cell Therapy Clinic, a full pharmacy, and a certified vision center, the medical offer for our patients has expanded. 3. Treat yourself to a relaxing day at the Timeless Antiaging Spa where you will find health and beauty treatments to treat your skin and overall well-being during your dental vacation. 4. Lodging: Traveling outside of your country to undergo a dental procedure can be exhausting. If you’re staying more than a few days due to the dental treatment or just because you want to enjoy this little town we recommend staying at two of the best hotels in town. Cielito Lindo is located at Mediplaza Los Algodones. It offers you excellent services as well as all the accommodations you may need. At Cielito Lindo we count with a nice Jacuzzi and a terrace where you’ll find the warmth and comfort, tradition and luxury style is what Cielito Lindo is all about! Hacienda Los Algodones located just four blocks from the border crossing. It counts with awesome rest areas and a pool where you’ll feel like you’re home! It’s one of the few hotels in the Molar City that it’s pet-friendly! Both of the hotels offer great services and accommodations, Wi-Fi service and they’re nicely fully decorated with Mexican adornment. Plus, Sani Dental Group patients are eligible for special rates at both hotels during their dental treatment! If you want further information on the promotions, contact us. If you haven’t eaten Mexican food in Mexico than you have to try a Mexican traditional dish at Mi Casa es Su Casa. The perfect place to enjoy a delicious dish with the best service in town. Come and enjoy a freshly brewed coffee and a sweet dessert at My Daily Treat. A nice little coffee shop you would not want to leave. If you’re looking for something fast and healthy to eat, we invite you to visit Quick Bites where you will find some healthy and nutritional options such as sandwiches, smoothies, salads and more! For our patients convenient, we offer a free shuttle service to them. If the patients desire the service, it will only be necessary to call us 48 hours before the appointment to schedule your vehicle. We can pick you up from the International border or the Yuma International Airport, what works best for you. We count with a team of patients coordinators that are ready to assist you in everything you need to start planning your dental vacation. They will gladly assist you with the set up for your trip and lodging, free shuttle service, payments facilities, and some useful tips to follow before and during your visit to Los Algodones, Mexico. Last but definitely not least, make sure to read some reviews of past patients about their experience at Sani Dental Group. You might also want to take a look at video reviews in order to verify all the points mentioned before about the doctors, the quality, and the attention at our clinics. We sure with all this information you’re ready to book your appointment with us to visit the best dentist in Mexico. Sani Dental Group is not only the largest dental group in Los Algodones, Mexico with more than 30 dentists and 30 years of experience dedicated to treating all your dental needs. Please contact us if you have any questions or doubts about any dental procedure, how much is dental work in Los Algodones, or anything else. It would be our please to assist you and to have you and your loved ones as patients of Sani Dental Group. We want to be part of your dental vacation while restoring your smile! Marketing Junior at Sani Dental Group that loves creating content to connect with others. I´am good at adapting to new situations and people.